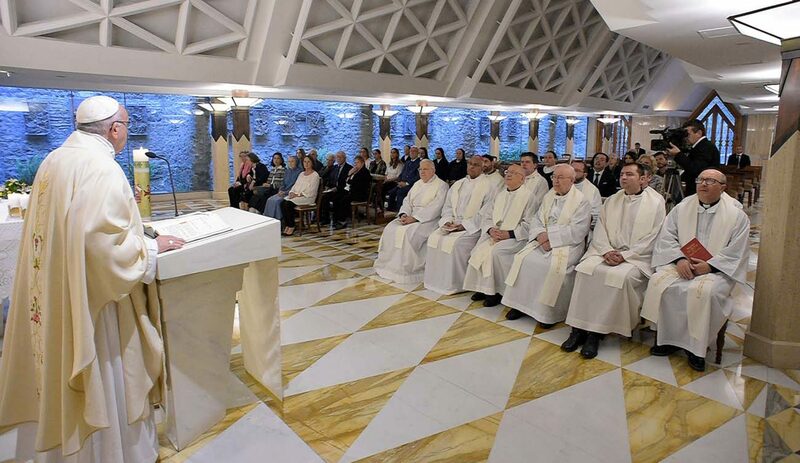 The devil “seduces us; he knows how to appeal to our vanity and curiosity and we buy it all,” the pope said May 8 during his homily at Mass in the chapel of the Domus Sanctae Marthae where he lives. “We must be aware of the devil,” he said, and Jesus taught his disciples that the only way to do that was to watch, pray and fast. And, Pope Francis said, it’s especially important that Christians don’t think they can approach the devil, see what he’s like and then just walk away unscathed. People know when they are playing with fire, the pope said. They know when they are approaching that angry dog. “Please, don’t,” he said, before imagining a dialogue in which someone cries about having been bitten, but it turns out the dog was chained up and he had approached it, basically provoking the injury.